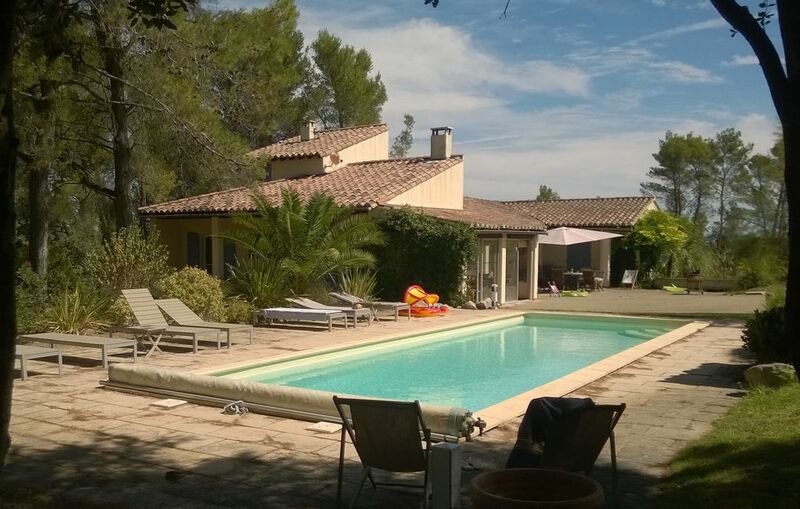 Exceptionally situated villa in Provence near Avignon, in a beautiful, calm setting where the view consists exclusively of mountains and trees, with rabbits and squirrels for company, plus chirping crickets in July and August. The photographs show the spacious terrace, the Montagnette (little mountain, pronounced Montanyet) at the bottom of the garden, the swimming pool, the Pétanque pitch (an area of flat ground surrounded by old railway sleepers to play bowls - a full set is supplied), and the view across the Rhone valley (although the river itself, about a mile away, is not visible from the house because of the trees). The nearest road is a quarter of a mile away, with very little traffic. The village is within walking distance (for the energetic), but a car is essential to enjoy the surroundings, when you can tear yourself away from the house, the pool and the Montagnette. A week's not really enough, so you'll be glad to know we offer DISCOUNTS for bookings of 2 weeks or more -- please contact owner BEFORE booking. With 3 bakers in the nearby village, you can enjoy freshly baked bread and croissants for breakfast every morning (including Sundays), sitting on the terrace soaking in the warmth and the stunning view of the Montagnette. OK, someone has to go and get them; you will be back in the time it takes to make a pot of coffee, and going into the village (especially the baker's) is always a pleasure. A short bus ride away is Avignon (*** maximum star rating in the Michelin Guide) with its famous (half) bridge ('Sur le Pont d'Avignon...'), Papal Palace, festivals, museums, concerts, street cafés and restaurants... Most famously the July Avignon Festival (mainly performing arts). Then there's the rest of Provence, with l'Abbaye de St Michel de Frigolet close by in the Montagnette, St. Rémy de Provence (Wednesday market) just a few kilometres to the south, Les Alpilles (mini-Alps), Glanum (ancient Greek and Roman Gallic city) and Les Baux (surreal hilltop village and fortifications, huge art displays inside the mountain, and superb wines). Follow the river south to Arles (Saturday market), or go west to Nîmes, Uzès and the famous Pont du Gard triple-decker Roman aqueduct. To the east visit Fontaine de Vaucluse, l'Isle sur la Sorgue (antique dealers on Sundays) and Gordes. Or Carpentras with its Friday market. From Greek antiquities, Roman temples and arenas, and medieval fortresses, to lively village fêtes with horse riders, Arlésiennes in their colourful traditional costumes, and bulls with the young braves running after them - or being chased - in the streets, you can be as relaxed or as busy as the mood takes you. The Mediterranean is about 40 miles away. You can choose the deserted flatlands of the Camargue (wild horses, bulls and pink flamingos), the unspoilt Les Saintes Maries de la Mer, medieval Aigues Mortes, or Le Grau du Roy with its 18 km (11 miles) of sandy beaches. Or you can keep it local, with horse riding, cycling, walking, practice golf, and ballooning. You can even join in a game of pétanque with the villagers! A leisurely drive through France is the ideal, if you have the time. If not, there is the A7 motorway. You can fly into Avignon, Nîmes, Marseille or Nice airports. Slip under the Channel on the Eurostar from London and Ashford (non-stop service to Avignon in the summer - less than 6 hours journey time), or skim across the French countryside on the TGV high speed train from Brussels and major French towns (only 2 hrs 40 mins from Paris to Avignon!). Car hire available at the airports and railway stations. And there's plenty of parking space at the villa. There's the space to be yourself. If you all want to be together in the living room or the dining room or round the barbecue or in the pool, no problem. But when you want to be on your own, you can come and go as you please without bumping into anyone else : counting the French windows there's 8 (yes, eight) entrances and exits from the bedrooms and other parts of the house to the main terrace, side terrace, kitchen terrace, pool area and garden (though you have to be tall enough to reach the upper locks on the front door and the French windows, so you needn't worry about a child wandering out). The grounds are on several different levels. You can curl up on a seat or stretch out on a sunbed in total privacy among the olives -- or under the pines -- or on an open lawn -- or behind a clump of large shrubs -- east, west, north and south of the house. You can exhaust yourself playing hide and seek with the children -- they'll win -- and it's a safe environment for them, provided you cover the pool (or set the pool alarm and have an adult close by). And even when you're out of sight, you need not fear starvation -- just outside the kitchen there's an old-fashioned ding-dong bell on the wall with a rope-pull for the cook(s) to call in the hungry. toilet, shower, (large walk-in shower); Washbasin. Each bedroom has its own, modern, 'en suite' shower or bathroom with toilet and washbasin. In addition, there is a downstairs toilet with washbasin, off the entrance hall (making a total of 5 toilets! ), and a semi-outdoor shower in the pool house. Every shower / bathroom has an outside window. Per person : pillow, pillow case*, pillow protector*, quilt (summer or winter), quilt cover*, sheet* and mattress cover*. More available on request. * changed and laundered every change-over. Open fireplace with safety fire-guard and fire irons. Logs supplied. Face towels, bath towels and pool towels supplied. (1) 'American' style coffee maker with throw-away paper filters or reusable mesh filter. (2) Nespresso machine which requires compatible aluminium capsules (available in the village store). Normally sufficient for 2 x 8 people. Main terrace and kitchen terrace each have table and chairs for 8. Choose for sun + view of Montagnette or shade & trees. Small side terrace on opposite side of house offers peace & quiet. A safety stool is provided for the shower. Except for the bedroom in the tower (with its bathroom) and the laundry room in the basement, the rest of the villa is on the ground floor. A car or van can be driven right up to the house (but please notify us in advance as that involves a gate which is normally kept shut). We can supply a wheelchair ramp for the low step up from the terrace. The only significant restriction on mobility is that the width of the doorways into the en-suite bath or shower rooms is slightly less than that of a standard wheelchair. Up to now this has not been an issue but we could arrange for a narrower wheelchair to be made available. Please contact us for more information. The house is fully equipped with modern furniture, linen and towels, and all the crockery, cutlery and domestic equipment you might expect including an 'American refrigerator' with ice and cold water dispenser. Baby's needs are also catered for: high chair, travel cot (easy to wheel out and park in the shade under a tree during the day), baby alarm (poolside is within range when baby is indoors), playpen, baby bath, paddling pool, sandpit, food mixer, steriliser etc. 12.5 x 4 metres swimming pool, ranging in depth from 120 cm to 180 cm. The pool has a security cover for when it's not in use -- to prevent children falling in, and to keep the heat in. Small children should always be watched when the pool is uncovered. There is a pool alarm as an additional safeguard - but that of course is no substitute for close supervision. We spent 1 week at Montagnette and wished it could have been longer as there is so much to see and do in the area. On arrival we were met by the caretaker as arranged and we found the property spotlessly clean and very comfortable with top quality appliances, a well equipped kitchen, very comfortable beds and modern power showers with ample hot water. The whole property is very spacious with plenty of options for outdoor seating and dining.We enjoyed the large pool and beautiful gardens, the only effort being that it's a 2 man job to take the cover off the pool. Barbantane is a quiet village within a 5 minute drive of the property. It has a grocery store and boulangerie but we found very few of the restaurants open during our stay. We took a walk up the Montagnette and were rewarded with a panoramic view of the region. Further afield you are within an easy drive of Avignon, Arles, Nimmes and Les-Baux de Provence in the Alpilles. It is also well worth the extra miles to get to Fontaine de Vaucluse which is really beautiful (take a picnic and swimming gear to enjoy the river setting). From there you can also reach the Abbaye de Senanque, Gordes and Isle-sur-la-Sorgue (weekend antique market). The Camargue is about an hour away but we were a little disappointed, it is very flat region and not particularly attractive and we saw more riding ponies than wild horses but perhaps we were just unlucky. This is a very comfortable property set in beautiful tranquil grounds within easy reach of many interesting places. A delightful property and thoroughly recommended. This is the second year we have stayed at La Montagnette, for 3 weeks each time, and we still haven't run out of new places to visit. The area is so full of wonderful towns, villages and sights. Barbentane itself is a beautiful, non touristy village with heaps of amenities and two good restaurants. And, of course, you are only 10 minutes away from all the choices in Avignon. But it is the house itself which is the star. So relaxing. A wonderful garden with lots of chairs and recliners for shade or sun worshiping and a beautiful pool. The house is always spotlessly clean when you arrive and cleaned at the end of each week if you stay for more than one week. The bedrooms, and particularly the bathrooms, are superb and there are lots of lounging places to relax. In the house. The kitchen has everything you could possibly want. Lovely artwork, lighting (inside and out) and all of the things that make for a truly wonderful stay. The only reason I didn't write a review last year was because I knew we would want to come back this year and didn't want it to get booked up! This is a lovely well maintained house, with everything you need for a great family holiday, peacefully located yet only five minutes drive from the boulangerie. The three main bedrooms have lots of space and storage, the attic room (as it says in the description) is smaller but still very nice, and quietly located away from the other rooms - good if you have a baby that wakes at 5.30am! It is great to have such a nice big pool, with plenty space around it for loungers. We had two small children in our party, there is a large paved patio area around the house, which is great for them to potter about while you sit in the sun. The ride-on tractor was a particular hit for our two, and the sand pit and wheel barrow were also popular and thoughtful additions. The owners were very helpful both when we were making the arrangements and during our stay. We'd highly recommend this house, one of the best we've stayed in. This house fulfilled all our expectations and more. Very good for our family group, which included 2 very young children. Three bedrooms on the ground floor all with en suite giving easy access to main parts of the house. The grounds are spacious, enabling childen to run around and explore and adults to find a shady spot away from it all. Pool was very well maintained. We particularly enjoyed watching the robot at work every day, cleaning up the pine needles! Kitchen is very well equipped, but equipment - cooker and microwave a little too sophisticated! There is plenty of information about local sights and games provided. We made good use of the sound system which could be extended to outdoors. The house very much has the feel of a family home. Communication with the owners has been friendly, informal and helpful. I would highly recommend this property. We all had a wonderful time. It was our one year old granddaughter's first holiday and she revelled in all the space. When the family went home, we enjoyed the peace and quiet of the second week. The St Jean festivities in the village were impressive, both the fire in front of the church and the parade through the village which was spectacular. Many thanks again for making your house available. We have stayed in many places around the world and La Montagnette is up therevwith the best of them. The villa stands in our private woodland -- pines, mediterranean oaks and olives -- of 8000 square metres (2 acres), grassed and wooded on a gently terraced hillside, a paradise for children and adults. To the south, from the end of the garden, it opens up into a natural reserve of 'garrigue' - rocky mediterranean scrubland and our mini-mountain range dominating the view from the terrace, leading one visitor to remark that in effect we had a 10,000 acre back garden - a slight over statement of course. East and west there is more woodland. North, the ground slopes down gently towards the Rhone through olive groves, farmland and orchards. Nearby (about 1 mile away) is the picturesque village of Barbentane: Medieval castle remains, 12th-15th century church, 17th century Château, narrow streets with steps and archways, old windmill, three boulangeries / patisseries (bakers and cake makers), butcher, greengrocer, supermarket and several restaurants. (1) DISCOUNTS offered out of peak season in 2019 : 25% -- May 25 to June 28 and Aug 31 to Sep 27 50% -- Mar 30 to May 24 and Sep 28 to Oct 25 75% -- until Mar 29 and from Oct 26 These discounts on the standard rate are reflected in the quoted price when you enter the dates. (2) DISCOUNTS also offered all year round for bookings of 2 weeks or more -- please contact owner BEFORE making a payment. For 2 weeks: 10% off total / for 3 weeks : 20% off total / for 4 weeks 25% off total (that's 4 weeks for the price of 3 single weeks!) (3) CHANGE-OVER day is normally a Saturday. Please contact owner if you wish to arrive or depart on a different day.